Turpan, also known as Turfan or Tulufan, is a prefecture-level city located in the east of Xinjiang, People's Republic of China. It has an area of 70,049 square kilometres (27,046 sq mi) and a population of 632,000 (2015). The original name of the city is unknown. The form Turfan (while it is older than Turpan), was not used until the middle of the 2nd millennium CE and its use became widespread only in the post-Mongol period. Historically, many settlements in the Tarim Basin have been given a number of different names. Some of these names have also referred to more than one place: Turpan/Turfan/Tulufan is one such example. Others include Jushi/Gushi, Gaochang/Qocho/Karakhoja and Jiaohe/Yarkhoto. The center of the region has shifted a number of times, from Yar-Khoto (Jiaohe, 10 km or 6.2 mi to the west of modern Turpan) to Qocho (Gaochang, 30 km or 19 mi to the southeast of Turpan), and to Turpan itself. Tarim Basin in the 3rd century. Turpan has long been the centre of a fertile oasis (with water provided by the karez canal system) and an important trade centre. It was historically located along the Silk Road. At that time, other kingdoms of the region included Korla and Yanqi. Along with city-states such as Krorän (Loulan) and Kucha, Turfan appears to have been inhabited by people speaking the Indo-European Tocharian languages in prehistory. The Jushi Kingdom ruled the area in the 1st millennium BC, until it was conquered by the Chinese Han dynasty in 107 BC. It was subdivided into two kingdoms in 60 BC, between the Han and its enemy the Xiongnu Empire. The city changed hands several times between the Xiongnu and the Han, interspersed with short periods of independence. 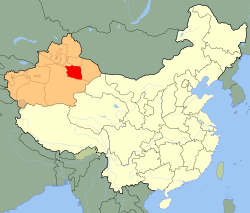 Nearer Jushi has been linked to the Turpan Oasis, while Further Jushi to the north of the mountains near modern Jimsar. After the fall of the Han dynasty in 220, the region was virtually independent but tributary to various dynasties. Until the 5th century AD, the capital of this kingdom was Jiaohe (modern Yarghul 16 kilometres (9.9 mi) west of Turpan). Many Han Chinese along with Sogdians settled in Turfan during the post Han dynasty era. The Chinese character dominated Turfan in the eyes of the Sogdians. Kuchean-speakers made up the original inhabitants before the Chinese and Sogdian influx. The oldest evidence of the use of Chinese characters was found in Turfan in a document dated to 273 AD. From 487 to 541 AD, Turpan was an independent Kingdom ruled by a Turkic tribe known to the Chinese as the Tiele. The Rouran Khaganate defeated the Tiele and subjugated Turpan, but soon afterwards the Rouran were destroyed by the Göktürks. The Tang dynasty had reconquered the Tarim Basin by the 7th century AD and for the next three centuries the Tibetan Empire, the Tang dynasty, and the Turks fought over dominion of the Tarim Basin. Sogdians and Chinese engaged in extensive commercial activities with each other under Tang rule. The Sogdians were mostly Mazdaist at this time. The Turpan region was renamed Xi Prefecture (西州) when the Tang conquered it in 640 AD, had a history of commerce and trade along the Silk Road already centuries old; it had many inns catering to merchants and other travelers, while numerous brothels are recorded in Kucha and Khotan. As a result of the Tang conquest, policies forcing minority group relocation and encouraging Han settlement led to Turpan's name in the Sogdian language becoming known as “Chinatown” or "Town of the Chinese". In Astana Cemetery, a contract written in Sogdian detailing the sale of a Sogdian girl to a Chinese man was discovered dated to 639 AD. Individual slaves were common among silk route houses; early documents recorded an increase in the selling of slaves in Turpan. Twenty-one 7th-century marriage contracts were found that showed, where one Sogdian spouse was present, for 18 of them their partner was a Sogdian. The only Sogdian men who married Chinese women were highly eminent officials. Several commercial interactions were recorded, for example a camel was sold priced at 14 silk bolts in 673, and a Chang'an native bought a girl age 11 for 40 silk bolts in 731 from a Sogdian merchant. Five men swore that the girl was never free before enslavement, since the Tang Code forbade commoners to be sold as slaves. The Tang dynasty became weakened considerably due to the An Lushan Rebellion, and the Tibetans took the opportunity to expand into Gansu and the Western Regions. The Tibetans took control of Turfan in 792. Buddhist Uyghur king from Turpan attended by servants. 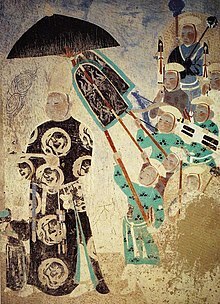 Depicted in Dunhuang Mogao Caves, Western Xia Dynasty. Clothing for corpses was made out of discarded, used paper in Turfan which is why the Astana graveyard is a source of a plethora of texts. 7th or 8th century old dumplings and wontons were found in Turfan. In 803, the Uyghurs of the Uyghur Khaganate seized Turfan from the Tibetans. The Uyghur Khaganate however was destroyed by the Kirghiz and its capital Ordu-Baliq in Mongolia sacked in 840. The defeat resulted in the mass movement of the Uyghurs out of Mongolia and their dispersal into Gansu and Central Asia, and many joined other Uyghurs already present in Turfan. In the early twentieth century, a collection of some 900 Christian manuscripts dating to the ninth to the twelfth centuries was found at a monastery site at Turfan. The Uyghurs established a Kingdom in the Turpan region with its capital in Gaochang or Kara-Khoja. The kingdom was known as the Uyghuria Idikut state or Kara-Khoja Kingdom that lasted from 856 to 1389 AD. The Uyghurs were Manichaean but later converted to Buddhism and funded the construction the cave temples in the Bezeklik Caves. The Uyghurs formed an alliance with the rulers of Dunhuang. The Uyghur state later became a vassal state of the Kara-Khitans, and then as a vassal of the Mongol Empire. This Kingdom was led by the Idikuts, or Saint Spiritual Rulers. The last Idikut left Turpan area in 1284 for Kumul, and then Gansu to seek protection of Yuan Dynasty, but local Uyghur Buddhist rulers still held power until the invasion by the Moghul Khizr Khoja in 1389. The conversion of the local Buddhist population to Islam was completed nevertheless only in the second half of the 15th century. Artifacts of Manichaean and Buddhist provenance are found in Turfan. Uyghur, New Persian, Sogdian and Syriac documents have been found in Turfan. Turfan also has documents with Middle Persian. After being converted to Islam, the descendants of the previously Buddhist Uyghurs in Turfan failed to retain memory of their ancestral legacy and falsely believed that the "infidel Kalmuks" (Dzungars) were the ones who built Buddhist monuments in their area. Buddhist images and temples in Turfan were described in 1414 by the Ming diplomat Chen Cheng. As late as 1420, the Timurid envoy Ghiyāth al-dīn Naqqāsh, who passed through Turpan on the way from Herat to Beijing, reported that many of the city's residents were "infidels". He visited a "very large and beautiful" temple with a statue of Shakyamuni; in one of the versions of his account it was also claimed that many Turpanians "worshipped the cross". "Mughal embassy", seen by the Dutch visitors in Beijing in 1656. According to Lach & Kley (1993), modern historians (namely, Luciano Petech) think that the emissaries portrayed had come from Turpan, rather than all the way from the Moghul India. Yunus Khan was irritated by the restrictions on the frequency and size of Turpanian missions (no more than one mission in 5 years, with no more than 10 members) imposed by the Ming government in 1465, and by the Ming's refusal to bestow sufficiently luxurious gifts on his envoys (1469). Accordingly, in 1473 he went to war against China, and succeeded in capturing Hami in 1473 from the Oirat Mongol Henshen and holding it for a while, until Ali was repulsed by the Ming Dynasty into Turfan. He reoccupied Hami after Ming left. Henshen's Mongols recaptured Hami twice in 1482 and 1483, but the son of Ali, Ahmad Alaq, reconquered it in 1493 and captured the Hami leader and the resident of China in Hami (Hami was a vassal state to Ming). In response, the Ming Dynasty imposed an economic blockade on Turfan and kicked out all the Uyghurs from Gansu. It became so harsh for Turfan that Ahmed left. Ahmed's son Mansur succeeded him and took over Hami in 1517. These conflicts were called the Ming Turpan Border Wars. Several times, after occupying Hami, Mansur tried to attack China in 1524 with 20,000 men, but was beaten by Chinese forces. The Turpan kingdom under Mansur, in alliance with Oirat Mongols, tried to raid Suzhou in Gansu in 1528, but were severely defeated by Ming Chinese forces and suffered heavy casualties. The Chinese refused to lift the economic blockade and restrictions that had led to the battles, and continued restricting Turpan's tribute and trade with China. Turfan also annexed Hami. Francis Younghusband visited Turpan in 1887 on his overland journey from Beijing to India. He said it consisted of two walled towns, a Chinese one with a population of no more than 5,000 and, about a mile (1.6 km) to the west, a Turk town of "probably" 12,000 to 15,000 inhabitants. The town (presumably the "Turk town") had four gateways, one for each of the cardinal directions, of solid brickwork and massive wooden doors plated with iron and covered by a semicircular bastion. The well-kept walls were of mud and about 35 ft (10.7 m) tall and 20 to 30 feet (6 to 9 m) thick, with loopholes at the top. There was a level space about 15 yards (14 m) wide outside the main walls surrounded by a musketry wall about 8 ft (2.4 m) high, with a ditch around it some 12 ft (3.7 m) deep and 20 ft (6 m) wide). There were drumtowers over the gateways, small square towers at the corners and two small square bastions between the corners and the gateways, "two to each front." Wheat, cotton, poppies, melons and grapes were grown in the surrounding fields. Turpan grapes impressed other travelers to the region as well. The 19th-century Russian explorer Grigory Grumm-Grzhimaylo, thought the local raisins may be "the best in the world", and noted the buildings of a "perfectly peculiar design" used for drying them called chunche. Mongols, Chinese, and Chantos all lived in Turfan during this period. 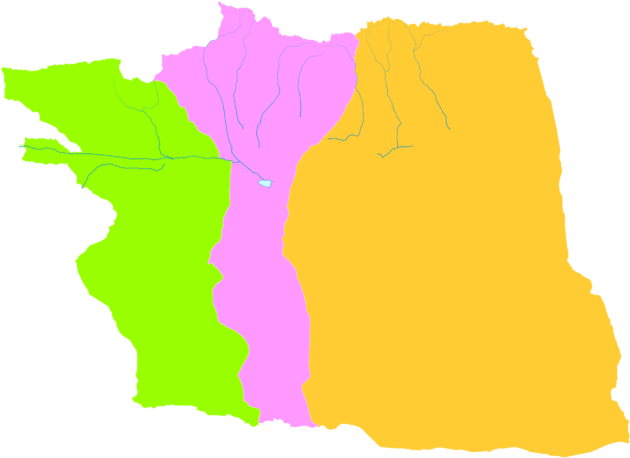 Turpan directly controls 1 district and 2 counties. View of the "Flaming Mountains"
Turpan is located about 150 km (93 mi) southeast of Ürümqi, Xinjiang's capital, in a mountain basin, on the northern side of the Turpan Depression, at an elevation of 30 m (98 ft) above sea level. Outside of Turpan is a small volcanic cone, the Turfan volcano, that is said to have erupted in 1120 as described in the Song Dynasty. Turpan has a harsh, drastic, cold desert climate (Köppen BWk), with very hot and long summers, and very cold and long winters, and brief spring and autumn in between. Between the months of March and October, the climate closely resembles a hot desert climate (BWh). Annual precipitation is very low, amounting to only 15.7 millimetres (0.62 in). The monthly 24-hour average temperature ranges from −7.6 °C (18.3 °F) in January to 32.2 °C (90.0 °F) in July, or a very large seasonal variation of 39.8 °C (71.6 °F); the annual mean is 14.4 °C (57.9 °F). With monthly percent possible sunshine ranging from 48% in December to 75% in September, sunshine is abundant and the city receives 2,912 hours of bright sunshine annually. Extremes have ranged from −28.9 °C (−20 °F) to 48.1 °C (119 °F), although a reading of 49.6 °C (121 °F) in July 1975 is regarded as dubious. However, the high heat and dryness of the summer, when combined with the area's ancient system of irrigation, allows the countryside around Turpan to produce great quantities of high-quality fruit. There is Chinese influence in the vocabulary of Uyghur dialect in Turfan. Turpan Uyghurs have more Han Chinese features and looks than Uyghurs elsewhere, and this is suggested to be due to intermarriage between Han Chinese and Uyghurs in the past according to the locals. Due to physical features found in Uyghurs in Turpan it was claimed that Uyghurs married slaves sent to Turpan's Lukchun area by the Qing according to the Manchu Ji Dachun. 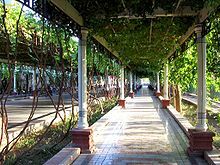 Turpan is an agricultural economy growing vegetables, cotton, and especially grapes being China's largest raisin producing area. There is a steady increase in farming acreage devoted to grapes backed by strong local government support for increased production. The local government has coordinated improvements in raisin distribution, offered preferential loans for grape cultivation, and free management training to growers. The annual Turpan Grape festival includes a mass wedding of Uyghurs funded by the government. Turpan is served by the Lanzhou–Xinjiang High-Speed Railway through the Turpan North Railway Station. Turpan is the junction for two conventional lines, the Lanzhou-Xinjiang and the Southern Xinjiang Railways. China National Highway 312 passes through Turpan. The Turpan Jiaohe Airport is close to Turpan North Railway Station. ^ Denis Sinor (1997). Inner Asia. RoutledgeCurzon. p. 121. ISBN 978-0-7007-0896-3. ^ Svat Soucek (2000). A History of Inner Asia. Cambridge University Press. p. 17. ^ Elizabeth Wayland Barber (2000). Mummies of Ürümchi. W. W. Norton, Incorporated. pp. 166–. ISBN 978-0-393-32019-0. ^ Hill (2009), p. 109. ^ Grousset, Rene (1970). The Empire of the Steppes. Rutgers University Press. pp. 35, 37, 42. ISBN 0-8135-1304-9. ^ Hill (2009), p. 442. ^ Baij Nath Puri (December 1987). Buddhism in Central Asia. Motilal Banarsidass. p. 70. ISBN 978-8120803725. ^ Valerie Hansen (2015). The Silk Road: A New History. Oxford University Press. pp. 83–. ISBN 978-0-19-021842-3. ^ a b c HANSEN, Valerie. "The Impact of the Silk Road Trade on a Local Community: The Turfan Oasis, 500-800" (PDF). Yale University Press. Archived from the original (PDF) on 18 April 2009. Retrieved 14 July 2010. ^ Xin Tangshu 221a:6230. In addition, Susan Whitfield offers a fictionalized account of a Kuchean courtesan's experiences in the 9th century without providing any sources, although she has clearly drawn on the description of the prostitutes' quarter in Chang’an in Beilizhi; Whitfield, 1999, pp. 138-154. ^ Wang, Y (1995). "A study on the migration policy in ancient China". Chin J Popul Sci. 7: 27–38. PMID 12288967. ^ Wu Zhen 2000 (p. 154 is a Chinese-language rendering based on Yoshida's Japanese translation of the Sogdian contract of 639). ^ Rong Xinjiang, 2001, pp. 132-135. Of the 21 epitaphs, 12 are from Quan Tangwen buyi (supplement to the complete writings of the Tang), five from Tangdai muzhi huibian (Collected epitaphs of the Tang), three were excavated at Guyuan, Ningxia, and one is from another site. ^ Jian Li; Valerie Hansen; Dayton Art Institute (January 2003). The glory of the silk road: art from ancient China. Memphis Brooks Museum of Art. The Dayton Art Institute. p. 35. ISBN 978-0-937809-24-2. ^ Valerie Hansen (11 October 2012). The Silk Road. OUP USA. pp. 11–. ISBN 978-0-19-515931-8. ^ 关于明代前期土鲁番统治者世系的几个问题. Chinese Academy of Social Sciences. ^ Zsuzsanna Gulácsi (2005). Mediaeval Manichaean Book Art: A Codicological Study of Iranian And Turkic Illuminated Book Fragments from 8th-11th Century East Central Asia. BRILL. pp. 19–. ISBN 90-04-13994-X. ^ Li Tang; Dietmar W. Winkler (2013). From the Oxus River to the Chinese Shores: Studies on East Syriac Christianity in China and Central Asia. LIT Verlag Münster. pp. 365–. ISBN 978-3-643-90329-7. ^ Ludwig Paul (January 2003). Persian Origins--: Early Judaeo-Persian and the Emergence of New Persian : Collected Papers of the Symposium, Göttingen 1999. Otto Harrassowitz Verlag. pp. 1–. ISBN 978-3-447-04731-9. ^ Hamilton Alexander Rosskeen Gibb; Bernard Lewis; Johannes Hendrik Kramers; Charles Pellat; Joseph Schacht (1998). The Encyclopaedia of Islam. Brill. p. 677. ^ ROSSABI, M.. 1972. “MING CHINA AND TURFAN, 1406-1517”. Central Asiatic Journal 16 (3). Harrassowitz Verlag: 212. https://www.jstor.org/stable/41926952. ^ Morris Rossabi (28 November 2014). From Yuan to Modern China and Mongolia: The Writings of Morris Rossabi. BRILL. pp. 45–. ISBN 978-90-04-28529-3. ^ Bellér-Hann., Ildikó (1995), A History of Cathay: a translation and linguistic analysis of a fifteenth-century Turkic manuscript, Bloomington: Indiana University, Research Institute for Inner Asian Studies, p. 159, ISBN 0-933070-37-3 . Christianity is mentioned in the Turkic translation of Ghiyāth al-dīn's account published by Bellér-Hann, but not in the earlier Persian versions of his story. ^ Trudy Ring; Robert M. Salkin; Sharon La Boda (1996). International Dictionary of Historic Places: Asia and Oceania. Taylor & Francis. p. 323. ISBN 1-884964-04-4. Retrieved 28 June 2010. ^ Luther Carrington Goodrich; Chao-ying Fang (1976). Dictionary of Ming Biography, 1368–1644. Columbia University Press. p. 1038. ISBN 0-231-03833-X. Retrieved 28 June 2010. ^ Jonathan D. Spence; John E. Wills, Jr.; Jerry B. Dennerline (1979). From Ming to Ch'ing: Conquest, Region, and Continuity in Seventeenth-Century China. Yale University Press. p. 177. ISBN 0-300-02672-2. Retrieved 28 June 2010. ^ Younghusband, Francis E. (1896). The Heart of a Continent, pp. 139-140. John Murray, London. Facsimile reprint: (2005) Elbiron Classics. ISBN 1-4212-6551-6 (pbk); ISBN 1-4212-6550-8 (hardcover). ^ Grigory Grumm-Grzhimaylo (Г. Грум-Гржимайло), East Turkestan (Восточный Туркестан), in Brockhaus and Efron Encyclopedic Dictionary. (in Russian) (The original quote: «Турфан же славится и своим изюмом, который можно считать лучшим в мире (высушивается в совершенно своеобразного типа сушильнях))», i.e. "Turfan is also famous for its raisins, which may be deemed the best in the world. They are dried in drying houses of a completely peculiar type". ^ The Geographical Journal. Royal Geographical Society. 1907. pp. 266–. ^ "Turfan". Global Volcanism Program. Retrieved 21 August 2011. ^ a b 中国地面国际交换站气候标准值月值数据集（1971－2000年） (in Chinese). China Meteorological Administration. Retrieved 3 April 2010. ^ "Extreme Temperatures Around the World". Retrieved 28 August 2010. ^ 新疆维吾尔自治区统计局 [Statistic Bureau of Xinjiang Uygur Autonomous Region]. 14 July 2017. ^ Abdurishid Yakup (2005). The Turfan Dialect of Uyghur. Otto Harrassowitz Verlag. pp. 174–. ISBN 978-3-447-05233-7. ^ Justin Jon Rudelson; Justin Ben-Adam Rudelson (1997). Oasis Identities: Uyghur Nationalism Along China's Silk Road. Columbia University Press. pp. 141–. ISBN 978-0-231-10786-0. ^ Justin Jon Rudelson; Justin Ben-Adam Rudelson (1997). Oasis Identities: Uyghur Nationalism Along China's Silk Road. Columbia University Press. pp. 141–. ISBN 978-0-231-10787-7. ^ a b c "China, People's Republic of Dried Fruit Annual 2007" (PDF). Global Agriculture Information Network. USDA Foreign Agricultural Service. ^ Summers, Josh (22 August 2014). "The Day I Ran Across a Mass Uyghur Wedding in Turpan". Far West China. ROSSABI, M.. 1972. “MING CHINA AND TURFAN, 1406-1517”. Central Asiatic Journal 16 (3). Harrassowitz Verlag: 206–25. https://www.jstor.org/stable/41926952. Morris Rossabi (28 November 2014). "Ming China and Turfan 1406-1517". From Yuan to Modern China and Mongolia: The Writings of Morris Rossabi. BRILL. pp. 39–. ISBN 978-90-04-28529-3. Wikimedia Commons has media related to Turpan. Wikivoyage has a travel guide for Turpan.